A program for those who care for people with Alzheimer’s disease and other related dementias reduces stress and increases competence. Primary care professionals (PCPs), when treating individuals with mild and major neurocognitive disorders, face myriad situations and conflicts revolving around the diagnosis and treatment. It’s a situation that increasingly will impinge on the clinical time they have available for these patients and their caregivers. The symptoms of ADRD that cause the most caregiver stress include atypical motor behaviors such as wandering, hallucinations, apathy, and agitation, the latter of which may involve cursing, incoherent speech, or nonsensical conversations.3 These symptoms lead to negative caregiver symptoms including anxiety, depression, exhaustion, disappointment, and anger, which thus negatively affect the care provided to the patient. These negative symptoms stem from dysfunctional coping strategies used when providing care.4 Caregivers tend to use these because they’re unaware of functional coping strategies, they lack education about the diagnosis of ADRD and the sudden onset of the symptoms, and they may deny the impact of the diagnosis. OTs are qualified to help PCPs and other caregivers find and use functional coping strategies, provide effective behavior techniques to use during caregiving, and help caregivers find occupational balance in their daily activities. A program was devised by an OT to reduce caregiver stress and increase caregiver competence among formal (health care professionals) and informal (loved ones) caregivers of individuals with ADRD. Although delivered by an OT, the concepts and skills explored throughout the program can be used by anyone who cares for those with ADRD. If implemented, the program—an adjunct to the care provided to those with ADRD—could reduce the demands on the PCP and office staff as well. The program was delivered in five 30- to 45-minute sessions once per week for five weeks. The participants were recruited via flyers and suggestions from health care professionals within the facility. This particular program was delivered in an assisted living and skilled nursing facility and was open to employees of the facility, those in the community, and patients’ loved ones. The group met in a closed meeting area within the facility to ensure confidentiality. Caregivers/participants who self-referred or who were referred by a PCP were provided with educational material on a variety of healthy outlets for stress and coping strategies that can be implemented into a daily routine. They were also given examples of unhealthful coping techniques so they could become aware of using these strategies and take steps to change these practices. Throughout the program, which functioned much like a support group, caregivers were encouraged to discuss their current stress outlets and coping strategies, or lack thereof, with other group members so members could share ideas for healthy coping strategies and correct unhealthful coping techniques in a supportive group environment. Caregivers participated in an educational session on occupational balance. They then developed their own daily schedules that depicted the balance, or imbalance, in their lives at that time and noted the imbalances. In group discussions and educational sessions, they learned to identify the changes needed in their daily routines in order to achieve occupational balance throughout their day and their lives. Educational sessions helped caregivers recognize and understand the differences between dysfunctional behavior strategies, emotion-focused strategies, and problem-focused strategies so they can identify the strategies they use. Other educational sessions involved role playing and the presentation of case studies to help participants learn to implement emotion-focused and problem-focused behavior strategies while caring for someone with ADRD. To test the program, a research project was designed and analyzed. The program began with 21 participants. Over the course of the five weeks, one participant’s loved one with ADRD passed away, another’s was hospitalized, one participant became sick after the third session of the program, and three participants weren’t able to find the time in their schedules to come to all five sessions. Therefore, 15 participants completed the entire program. Only one of these participants was a loved one; the remaining 14 were health care practitioners. 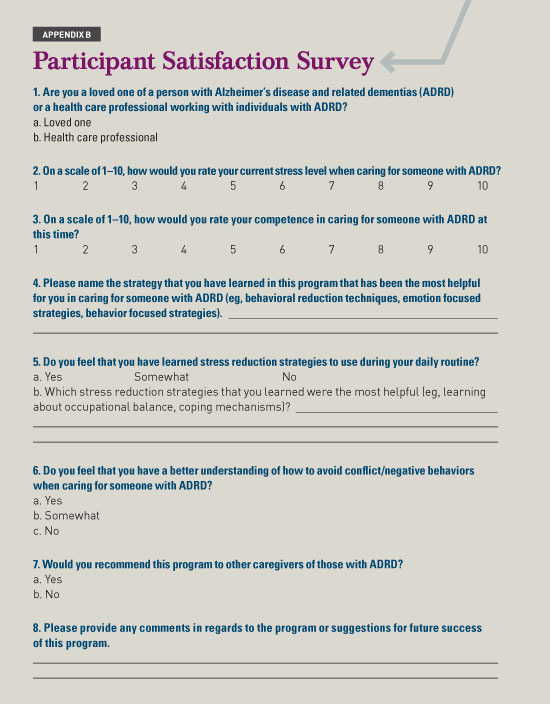 A survey was utilized (see Appendix A below) at the beginning of the program composed of a combination of open-ended, Likert scale, and multiple-choice questions to ensure that as much information as possible could be gained from the participants. Among the questions, participants were asked to rate their stress levels and their competence in providing care as well as to state whether they used any stress reduction techniques. At the start of the program, the average stress level was 6.3 out of 10, as was the average self-rated competence level in caring for someone with ADRD. 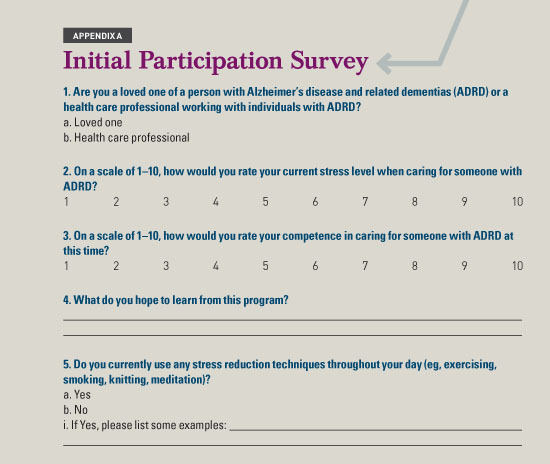 The survey revealed that participants hoped to learn communication techniques to use with individuals with ADRD, how to decrease caregiver burden and stress, and how to implement healthy coping strategies into their days. In the initial survey, 46.7% of participants stated they did not have any coping strategies and did not use stress reduction techniques in their daily routines. The remaining participants stated that they reduce stress by shopping, exercising, reading, meditation, giving themselves a “time-out,” crying, smoking, drinking, talking to loved ones, and/or taking medications. As noted previously, the average stress levels of participants decreased following the five sessions of the program and the average competence in caring for someone with ADRD increased. Prior to their participation, more than one-third of participants could not name any stress reduction techniques they used, but after completing the sessions, all were able to name such techniques and coping mechanisms. 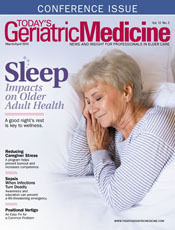 The findings of this study support program protocols centering around implementing effective behavior strategies and coping techniques into the caregiver routine in order to maintain the health and quality of life and possibly improve outcomes for both the caregivers and their patients. The study provides evidence that OTs’ skills are crucial in in helping improve both the mental and physical well-being of both caregivers and their patients. On average, caregiver stress levels appear to have decreased while competence levels improved, changes that are likely to contribute to increased quality of life for care providers as well as individuals with ADRD. OTs are skilled professionals who are competent in creating effective programming. More research needs to be conducted about how they can help reduce the stress of PCPs and other caregivers of those with ADRD. — Nicole Schwartz, MS OTR/L, works at CareOne Harmony Lodge, Memory Care Assisted Living in Jackson, New Jersey, and is a postprofessional student at Misericordia University. 1. Large S, Slinger R. Grief in caregivers of persons with Alzheimer’s disease and related dementia: a qualitative synthesis. Dementia (London). 2013;14(2):164-183. 2. Agronin ME. Alzheimer’s Disease and Other Dementias: A Practical Guide. 3rd ed. New York: Routledge; 2014. 3. Liu S, Jin Y, Shi Z, et al. The effects of behavioral and psychological symptoms on caregiver burden in frontotemporal dementia, Lewy body dementia, and Alzheimer’s disease: clinical experience in China. Aging Ment Health. 2017;21(6):651-657. 4. Lau BH, Cheng C. Gratitude and coping among familial caregivers of persons with dementia. Aging Ment Health. 2017;21(4):445-453. 5. Edwards M. Family caregivers for people with dementia and the role of occupational therapy. Phys Occup Ther Geriatr. 2015;33(3):220-232.